Launched. The ceremony is attended by Vice Admiral (later Admiral, Navy Minister) Yonai Mitsumasa (29), the commandant of Sasebo Naval Base. LtCdr (Rear Admiral, posthumously) Iwagami Eiju (46)(former division officer of NARUTO) is appointed the Chief Equipping Officer (CEO). I-70 is completed and attached to Kure Naval District. She is assigned to SubDiv 12 as the new division flagship. LtCdr Iwagami Eiju is the Commanding Officer. LtCdr (Captain, posthumously) Ohata Tadashi (50)(former CO of RO-67) is appointed the CO.
LtCdr (Captain, posthumously) Izu Juichi (51)(former CO of I-123) is appointed the CO.
LtCdr Izu is appointed the CO of I-69 as an additional duty. Placed in third reserve. During a refit at Kure, the submarine is fitted with a Type 93 passive sonar and an improved attack computer. LtCdr (later Captain) Inaba Michimune (51)(former CO of CHIDORI/MANAZURU) is appointed the CO of I-69 (until 1 September) and I-70 as additional duty. LtCdr (promoted Cdr 15 November; Captain, posthumously) Sano Takao (50)(former CO of I-63) is appointed the CO.
Captain (Rear Admiral, posthumously) Nakaoka Nobuki's (45), ComSubDiv 12 flag is transferred to I-69. Cdr Sano is appointed the CEO of I-23 as additional duty. I-70 is reappointed the flagship of SubDiv 12. I-69 collides with I-70. I-70 suffers a long gash forward in her starboard tanks almost back to the conning tower and I-69 suffers a damaged bow. Both submarines return to Yokosuka for repairs. SubDiv 12's flag is transferred to I-68. I-70 is in Vice Admiral Shimizu Mitsumi's (former CO of ISE) Advance Expeditionary Force (Sixth Fleet) with Rear Admiral (later Vice Admiral) Miwa Shigeyoshi's (former CO of CL KINU) SubRon 3 in Captain (Rear Admiral, posthumously) Nakaoka Nobuki's (later CO of ATAGO) SubDiv 12 with I-68 and I-69. Admiral Shimizu convenes a meeting of all his commanders aboard his flagship, light cruiser KATORI. Cdr Sano and the other commanders are briefed on the planned attack on Pearl Harbor. Departs Saeki in company of I-68. Arrives at Kwajalein. Refuels and reprovisions. The coded signal "Niitakayama nobore (Climb Mt. Niitaka) 1208" is received from Combined Fleet. It signifies that hostilities will commence on 8 December (Japan time). 4 miles SW of Diamond Head, Oahu, Hawaii. At 0130 Cdr Sano reports an American carrier (USS ENTERPRISE (CV-6) arriving at Pearl Harbor. This is the last signal received from I-70. I-6 reports sighting a LEXINGTON-class aircraft carrier and two cruisers heading NE. Vice Admiral Shimizu in KATORI at Kwajalein orders SubRon 1 and other boats to pursue and sink the carrier. 121 miles NE of Cape Halava, Molokai, Hawaiian Islands. After 0600 in the morning, Ens Perry L. Teaff's Douglas SBD-2 "Dauntless" dive-bomber of VS-6 from USS ENTERPRISE (CV-6) attacks I-70 on the surface and scores a near-miss with a 1,000-lb bomb that damages the submarine, preventing her submerging. 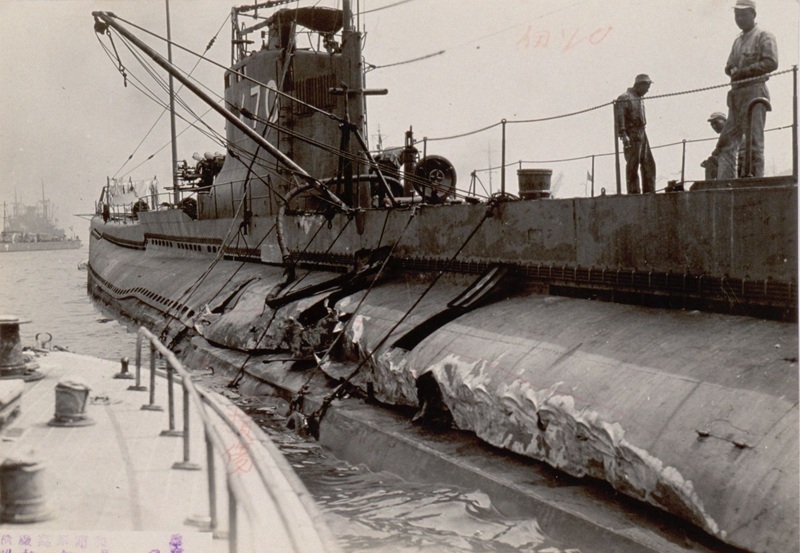 The bomb dropped from the "Dauntless" lands right beside the submarine, amidships. Its explosion throws several gunners over board. I-70 stops and starts to settle on the even keel, disappearing underwater about 45 seconds after the explosion at 23-45N, 155-35W. When Dickinson returns to the scene of the sinking, he sights four IJN sailors flailing in the water. A bubble of oil and foamy water appears on the surface, followed by two more bubbles, containing oil and debris. I-70 is the first Japanese combatant ship sunk by United States aircraft during World War II and the first fleet submarine lost in the Pacific War. Sixth Fleet's headquarters tries to contact I-70, even after the other subs of her division return to Kwajalein. The effort is unsuccessful. I-70 is presumed lost with all 93 hands off Hawaii. On 7 Dec '41, while en route from ENTERPRISE to Pearl Harbor with a flight of 18 planes, Lt Dickinson was shot down by an A6M2 "Zeke" fighter of the Pearl Harbor Attack Force. His rear gunner was KIA, but Dickinson survived to sink I-70 three days later. Dickinson reported that the submarine he attacked had fired back from no less than two deck guns, while I-70 had only one.